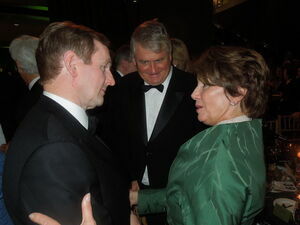 Enda Kenny, Denis O’Brien and Democrat minority leader of the US House of Representatives Nancy Pelosi at the American Ireland Fund dinner at the Ronald Reagan Building and International Trade Centre. Before sitting down to dinner, House Democratic Leader Nancy Pelosi, in an elegant Thierry Mugler jacket and pearl choker, huddled with Kenny and Irish businessman Denis O’Brien, while the Irish ambassador to the U.S., Michael Collins, made sure his table guests from both sides of the Atlantic were properly introduced. Earlier: What Is Ireland Inc? Posted in Misc and tagged Denis O'Brien, Enda Kenny at 5:23 pm on March 20, 2012 by Broadsheet.